There are so many stories of “Jinn possession”, “black magic”, “evil eye” and “exorcism” in the muslim communities. However, very few know what the reality of these situations are. Very often gullible people are exploited for profit by charlatans who pretend to be religious. But what is even more disturbing is to see some religious people carrying strange beliefs about the Jinn because of ignorance, here-say, legends, tradition, culture and “experience”. No doubt there are so many confusing questions about the Jinn, Black Magic, Evil Eye and Exorcism. But who do we turn to for answers? Do we go to “professional exorcists” or to knowledgeable and pious Islamic scholars who are the inheritors of Prophets and Messengers (peace be upon them all). 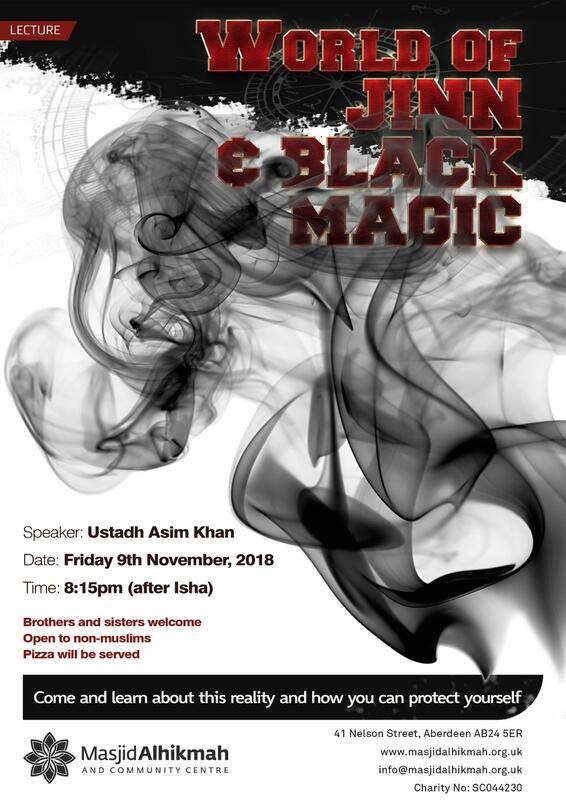 Come and learn about this mysterious world from Ustadh Asim Khan. This lecture is open to muslims and non-muslims alike. Pizza will be served after the lecture!